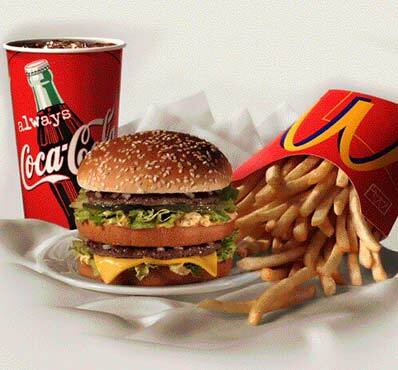 Product :- McDonald’s places considerable emphasis on developing a menu which customers want. Market research establishes exactly what this is. However, customers’ requirements change over time. In order to meet these changes, McDonald’s has introduced new products and phased out old ones, and will continue to do so. Care is taken not to adversely affect the sales of one choice by introducing a new choice, which will cannibalize sales from the existing one (trade off). McDonald’s knows that items on its menu will vary in popularity. Their ability to generate profits will vary at different points in their cycle. 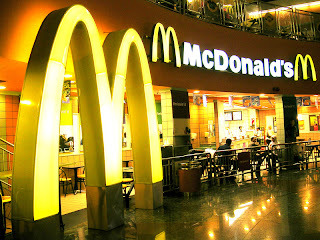 In India McDonald's has a diversified product range focusing more on the vegetarian products as most consumers in India are primarily vegetarian. The happy meal for the children is a great seller among others. Price :- The customer’s perception of value is an important determinant of the price charged. Customers draw their own mental picture of what a product is worth. A product is more than a physical item, it also has psychological connotations for the customer. The danger of using low price as a marketing tool is that the customer may feel that quality is being compromised. It is important when deciding on price to be fully aware of the brand and its integrity. In India McDonalds classifies its products into 2 categories namely the branded affordability (BA) and branded core value products (BCV). The BCV products mainly include the McVeggie and McChicken burgers that cost Rs. 50-60 and the BA products include McAloo tikki and Chicken McGrill burgers which cost Rs. 20-30. This has been done to satisfy consumers with different price perceptions. Promotion :- The promotions aspect of the marketing mix covers all types of marketing communications One of the methods employed is advertising, Advertising is conducted on TV, radio, in cinema, online, using poster sites and in the press for example in newspapers and magazines. Other promotional methods include sales promotions, point of sale display, merchandising, direct mail, loyalty schemes, door drops, etc. The skill in marketing communications is to develop a campaign which uses several of these methods in a way that provides the most effective results. For example, TV advertising makes people aware of a food item and press advertising provides more detail. This may be supported by in-store promotions to get people to try the product and a collectible promotional device to encourage them to keep on buying the item. At McDonald's the prime focus is on targeting children. In happy meals too which are targeted at children small toys are given along with the meal. Apart from this, various schemes for winning prices by way of lucky draws and also scratch cards are given when an order is placed on the various mean combos. Place :- Place, as an element of the marketing mix, is not just about the physical location or distribution points for products. It encompasses the management of a range of processes involved in bringing products to the end consumer. McDonald’s outlets are very evenly spread throughout the cities making them very accessible. Drive in and drive through options make McDonald’s products further convenient to the consumers. · A product with many different features provides customers with opportunities to chat, play games, send and receive pictures, change ring tones, receive information about travel and sporting events, obtain billing information - and soon view video clips and send video messages. · Vodafone live! provides on-the-move information services. · Vodafone UK operates over 300 of its own stores. 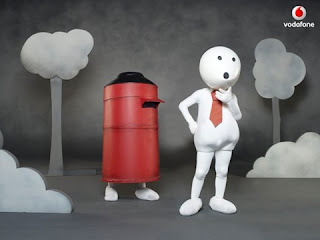 · It also sells through independent retailers e.g. Carphone Warehouse. · Customers are able to see and handle products they are considering buying. · People are on hand to ensure customers’ needs are matched with the right product and to explain the different options available. · Vodafone wants to make its services accessible to as many people as possible: from the young, through apprentices and high powered business executives, to the more mature users. · It offers various pricing structures to suit different customer groups. · Monthly price plans are available as well as prepay options. Phone users can top up their phone on line. · Vodafone UK gives NECTAR reward points for every £1 spent on calls, text messages, picture messages and ring tones. Vodafone works with icons such as David Beckham to communicate its brand values. · Advertising on TV, on billboards, in magazines and in other media outlets reaches large audiences and spreads the brand image and the message very effectively. This is known as above the line promotion. · Stores have special offers, promotions and point of sale posters to attract those inside the stores to buy. · Vodafone’s stores, its products and its staff all project the brand image. · Vodafone actively develops good public relations by sending press releases to national newspapers and magazines to explain new products and ideas. is also clearly demonstrating what Vodafone live! can do.